All over the world people and objects are connected to the internet to access information and communicate with other people and do business. Millions and trillions of data are being generated on a daily basis. The concept of Internet of things (IoT) evolved rapidly, which enabled billions of things to connect to as many people as possible. IoT is nothing but the technology which connects the people and all the possible things in the world to make human life easier. For example: Consider a car which has an access to calendar and whenever one is stuck in traffic, the car automatically notifies the meeting organiser about his/her being late to the meeting. It’s forecasted that, by 2020, IoT could include between 30 billion and 75 billion things ranging from smartbands, toys to medical devices, earthquake sensors etc. Businesses wished to translate billions of data points into real time human interactions .The Internet of Things took a makeover as the Internet of Customers. After all, behind everything is a real customer. This led to the emergence of IoT cloud to convert business data into real time personal customer interactions. 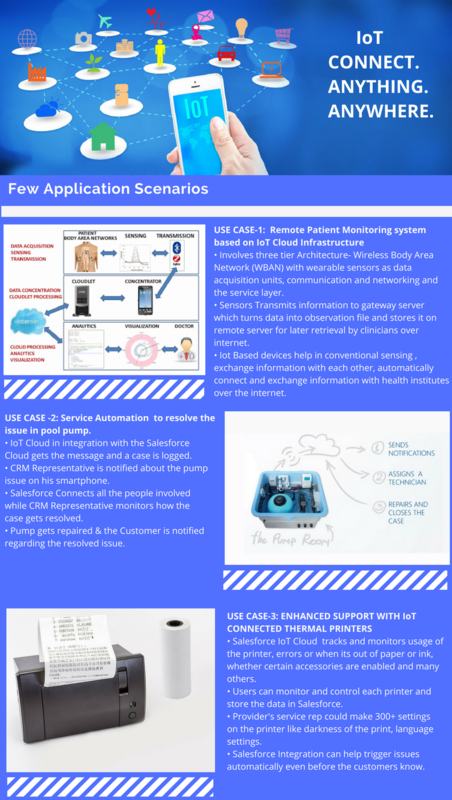 Salesforce Internet of Things (IoT) Cloud Service is a secure and scalable platform designed to help organizations quickly build and deploy IoT applications and fully capture /analyze and process IoT data. Powered by Thunder, a scalable real-time event processing engine, it is built to take in the massive volumes of data generated by devices, sensors, websites, applications, customers and partners and provide appropriate actions for real time customer interactions. 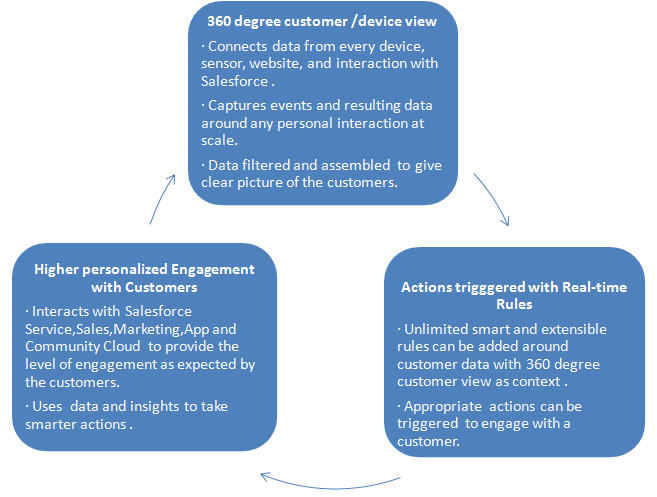 How Salesforce IoT Cloud Technology works? IoT Cloud Einstein– The Generation Forward!! Customers would be able to stream data to AI algorithms that can be trained to do predictive scoring . This would help indicate when a particular would require service /upgrade. Automatically Optimize IoT Device Journeys by feeding data about a device journey into IoT Cloud Einstein.